The first international NFC marketing service is to go live on 1 April, allowing customers of NTT Docomo and KT to collect and redeem special offers from NFC posters in both Japan and Korea — and payments and ticketing services as well as the participation of carriers in additional Asian countries are set to follow. 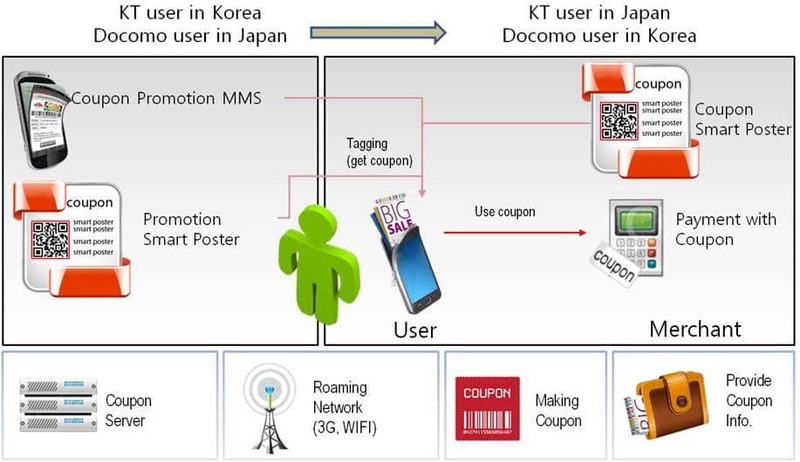 Japanese mobile network NTT Docomo and Korean operator KT are to launch the first cross-border NFC couponing service on 1 April. International payments and ticketing services are also due to be added in the near future as well as NFC roaming deals with carriers in additional Asian countries. The initial cross-border service will see the two carriers providing NFC smart posters at Tokyo’s Haneda airport and Seoul’s Gimpo airport as well as at a variety of shopping malls in the two cities. Customers with an NFC phone will be able to use the service in either country to download coupons and special offers as well as to access tourist information and maps in their own language so that they can easily locate local merchants offering discounts and redeem coupons at participating merchants. COUPONS: How the cross-border NFC system works. Click to enlarge. The carriers’ platform also allows coupons to be sent to subscribers’ phones via MMS and support for QR codes will also be included. The plan is to then expand cross-border capabilities step by step across Asia as a series of ‘NFC Zones’, NTT Docomo’s Kyoshi Mori has told NFC World. From that foundation, the aim is to then link up with carriers in the US and Europe to create a globally compatible service. NTT Docomo is already working with China Mobile on the project, Mori added, and is also in discussion with carriers in countries such as the Philippines, Vietnam, Thailand and Hong Kong. Google Wallet heading to Apple iOS devices?